I had been meaning to make clafoutis since watching it on Junior Masterchef last year. Well, it so happened that I had some sour grapes (really, they were too sour for my liking, apart from Z who seemed to think they were sweet!) and a handful of cherries in the fridge, and I thought it would be a good way to use up the grapes if nobody (except Z) was going to eat them. I decided to try out the recipe on Masterchef which is a Cherry and White Chocolate Clafoutis, although I omitted some of the extra touches like the marinated cherries, mascarpone cream and cherry compote (okay that's like half the recipe already). All I wanted to do was find some use for those grapes! 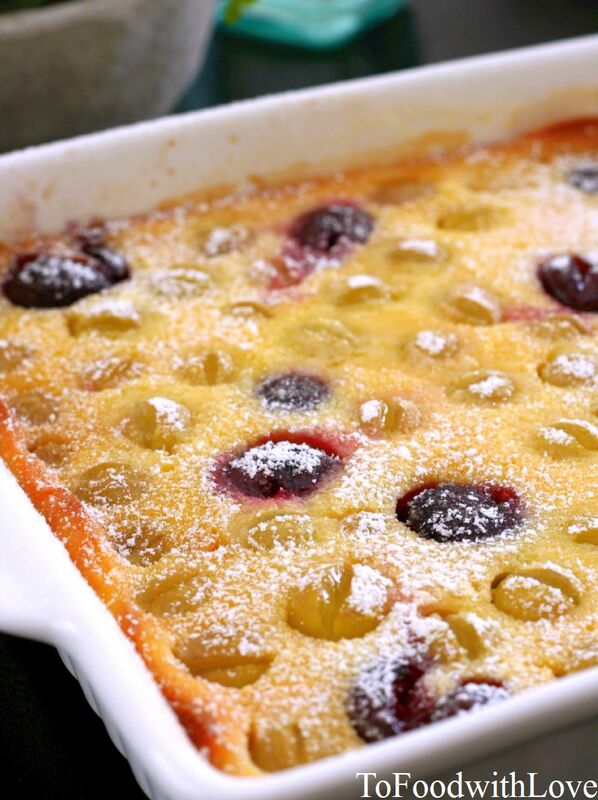 Having clafoutis for the very first time, it is a sweet flan-like dessert, with a pancake/bread pudding texture. The sweetness of the pudding and white chocolate bits (I used white choc chips instead of grated white chocolate) is a nice contrast to the tartness of the grapes and cherries, which are warm, soft and juicy. This is an easy dessert that everyone can prepare at home, using various types of berries, stone fruits, apples etc (I wonder how a durian clafoutis would turn out though). It's also one that you can get your kids to help out with. Z enjoyed helping to pick the grapes and cherries off the stems, assembling them in the dish and mixing the batter. Maybe next time I could get him interested in the clean-up after that!